Togo and Arsenal striker Emmanuel Adebayor was named the Confederation of African Football's Player of the Year on Tuesday. The award was decided by a poll of African national team coaches, and Caf's figures gave Adebayor 74 points to Aboutrika's 53. 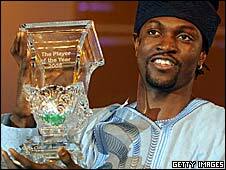 "I'm highly honoured by what I have done in African football," said Adebayor at the awards ceremony in the Nigerian city of Lagos. "Now that the World Cup is coming close and is in Africa, we'll work hard to win the championship."